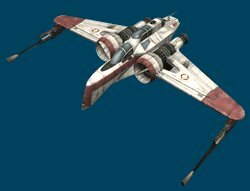 A three seated attack fighter, the ARC-170 is the primary assault fighter of the Galactic Republic during the Clone Wars era. Sturdy and capable in its job, the combination of blasters, lasers and concussion missiles make it a force to be reckoned with in an era dominated by light fighters. Carries six concussion missiles at 5 cp each, launch rate 2 per turn.